Anne Weiss is a blues, soul and roots music singer/songwriter, guitarist and pianist with five albums to her credit. She studied classical piano, joined a street gang, became a mountaineer, developed a guitar obsession, worked as a political organizer, learned to salsa dance, became addicted to delta blues, sang with a 100-voice gospel choir, and yes, you will hear it all in her music. Combining soulful blues, acoustic funk, contemporary folk, gospel music, and smatterings of classical phrasing and Latin rhythms, Anne is known for her enormous bluesy voice, great guitar chops, and striking stage presence. Anne adds funk(!) ukulele and emotive piano work to many of her performances. She is a standout songwriter who has been covered by many artists. Anne’s first recording work was with Shawn Colvin and Dar Williams. It wasn’t long before she was opening concerts for Richie Havens and Chris Smither. Three decades later, Anne has performed with everyone from Ani DiFranco to Taj Mahal. She tours internationally and is featured at blues, folk, world music festivals, and teaches, performs, and produces music in at her home base, Portland Oregon. 8.5 x 11 Black and White (good for small flyers). 8.5 x 11 Color (also good for small flyers). The above posters are editable in Adobe Acrobat. Simply download the poster, enter your information, save, and print. Tiza font available here. This is the font used for the names. Something to Talk About – A tribute to Bonnie Raitt. Welcome to the best Anne Weiss CD so far. I’m a long-time Anne Fan and Where Folk Gets the Blues captures her every dimension and talent. Spend the afternoon rockin’ to the belt-it-out-blues-mama cuts that leave one awestruck wondering, “just how does she do that with her voice?” Or close your eyes and listen deeply to the poetic, provocative and politic lyrics that create images of a better world. Across each and every tune, Anne delivers amazing range, originality, purity and huge heart. Thanks Anne. You inspire. In a city like Portland that is filled with outstanding musicians of numerous genres, Anne Weiss stands tall when it comes to overall talent and songwriting. A tremendous vocalist, she is also a multi-instrumentalist who may take on a song behind a guitar, ukulele or piano at any given moment. And she is more than exceptional at all. Where Folk Gets The Blues is a double CD that offers two musical directions from Anne’s repertoire. Disc one is comprised of phenomenal folk selections performed by Anne mostly in a solo setting. Crafty lyrics that are worthy of top shelf literature. These songs should leave no doubt that Anne Weiss is amongst the masters of today’s folk scene. Some of the selections have previously appeared on earlier Anne Weiss CDs and there are several that were recorded live at the River Folk Festival. If you enjoy folk or blues you should find something that appeals to you on Where Folk Gets The Blues. An incredible release from an incredible artist. Anne Weiss proves that she can cross musical lines with over the top results. Where Folk Gets The Blues breathes with emotion and is a definite display of the talents of an artist who knows how to deliver music that is enjoyable and satisfying on all counts. Anne, originally from New York but now based in Portland, Oregon is an accomplished singer, songwriter and guitarist. The clue is in the album title as the music is folk-blues in the 60s/70s style. Vocally she sounds akin to Joni Mitchell on the folk material but she can put some bite into her voice when the song needs it. This is a two CD set with one labeled ‘Folk’ and the other ‘Blues’ but there is a fair amount of crossover. On the Folk album, where all songs are originals, ‘Down To The Garden’ is a ragtime-style song where Anne shows off her guitar chops, which she also does on the instrumental ‘Walker’s Rag’. The ‘Blues’ CD has a mix of covers and originals. There are two RJ songs with ‘Come on in My Kitchen’ being particularly fine, as it is up-tempo, with a funky beat, horns and harp – a very different interpretation. ‘Walk Down the Road’ has a jazzy edge and 60s-style protest is evoked by ‘Hop in the Truck’. Unlike the solo ‘Folk’ CD the ‘Blues’ CD has guests including Mary Flower on three songs. This is as much a folk album as a blues one but with musicianship of the quality on display here that really doesn’t matter. A most enjoyable listen and well worth checking out. folk self covered in a grey shawl. Or is it the other way round? growls, it swings, it soars, it shouts, and it pleads. freedom, and creates a gospel feeling that lasts through to the end of the album. weave together to suggest that harmony is possible in a broken world. becomes a prayer that “every day we work for change is a good day just the same”. some National steel guitar from David Jacobs-Strain. the undoubted high point of the album. sharp knife underlying an abused exterior. topic of guilt and original sin. “Shadow of Doubt” explores the depths of agony in a doubt that can never be relieved. And each one part of the whole. This is a song for all souls. on Love In Vain that is not credited. world to become a better place. Anne Weiss has a beautiful voice, especially when she is singing folk music. She sings it with longing, hope, wistfulness, sorrow, and humor as the songs dictate. There are hints of Joni Mitchell here and there, but her voice is her own. She also accompanies herself very nicely on guitar and piano. More than all this, though, is her songwriting. Her folk tunes are everything you want from the genre, from the reflective “Have Some Peace” to the poignantly political “Cherokee.” Weiss’s songs explore the traditional canon of folk subject matter and emerge with a CD of remarkable variety. They all work at various levels, but some tracks are stand-outs. “Compass” is an ethereal lament for a love who is about to go off into the world. If the harmonies of Weiss and guest Mary Cole don’t make the hair at the back of your neck stand up, you had better check your wrist for a pulse. “Quenching Ground” is a beautiful song that ultimately is a guide to our quest for personal and, in many ways, societal redemption. It is particularly haunting with Ms. Weiss providing her own subtle and intricate harmonies. Its beauty lingers like the dissipating reverberations of a church bell echoing away to silence. The intensely personal and evocative “Particle of Rain” is not so much a song as it is a poetic exploration expressed by music and Ms. Weiss’ clarion voice. It is the most intimate song on the CD and it made me want to take her by the hand and walk along an endless shore. This is followed by the anthemic “Day of Celebration.” Elton John was once asked how to write a great song. “Write a hymn,” he answered. This song is a wonderful hymn, secular though it may be, sung by a small choir consisting entirely of vocals by Ms. Weiss. This is beautiful folk music that pays homage to the golden years of the Greenwich Village folk scene of the late 1950s and early ’60s while maintaining a sound that is very much of the 21st century. It is a tour de force. All this makes reviewing the blues half of this two-CD compilation so difficult. It is excellent blues-inspired folk music. She does a wonderful take on Elmore James’ “It Hurts Me Too,” accompanied only by Mary Flower’s lap steel guitar, (done) with such wonderfully original arrangement. You have to love a blues song in which the first few lines reference John Muir, Walt Whitman, and Jack Kerouac. “John Muir’s Brook” is a even more of an anthem than “Day of Celebration” thanks to the superb Just Add Soul Gospel Choir. Anne Weiss is a talented singer-songwriter. – Kim O’Brien is a contributing writer at BluesWax. “Two excellent CDs. Overall we personally prefer the second CD, although ‘Compass’ on CD 1 is an unrivaled highlight. Anne Weiss is a highly enthralling character living around us at the present time. ‘Where Folk Gets The Blues’ gives us the opportunity clear a blind spot in our fragmented knowledge of American music”. Anne Weiss is a local vocalizing treasure. Shes a songwriter, blues belter, gospel wailer, singing teacher and very much alive and kicking with an enormous voice. After 6 independent releases, many life-miles and gigs, shes just released a new double CD, Where Folk Gets the Blues, an ambitious project in these days of disappearing CDs. Weiss is political, poetic, a funky, folky, fingerpicker and expressive impressive pianist too. Originally from New York, she was part of the 80s and 90s New England songwriters community. Shes sung and hung with Shawn Colvin, Dar Williams and Patty Larkin but its not who else was there as much as where she has gone with it all since. Disc one is Weiss contemplative side, both energetic and sombre. The songs are moving, the writing illustrative, tender and wise. Recorded at Billy Oskays Big Red Studio, the spatiality is clearly musical here too. Disc two is bluesy and brazen, a rave up with classics, originals and guests Mary Flower, Billy Oskay, David Jacobs-Strain and the Just Add Soul Gospel Choir. It took two discs to catch this waterfall of tunes! www.anneweiss.com . Her next local show is Tuesday, August 21- A Secret Garden Summer Concert at the International Hostel, 425 NW 18th Ave., 6:30 – 9:30 pm. 7:30 pm. 503.241.2783 / www.nwportlandhostel.com . 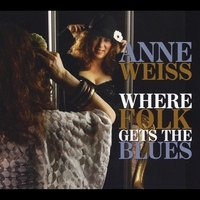 “Anne Weiss has beautifully and strongly realized the connection with folk and blues by immersing herself in their soul, both as an original artist and creative interpreter”. There really isn’t anyone else out there like Anne. Her last album was phenomenal, this one is even better. There are so many mediocre bands and artists, a few very good ones and lots of bad ones getting serious airplay, why isn’t someone with all the talent a household name? Anne’s music should be in heavy rotation all across the world. Every song on this collection is a real gem! Incredible vocals, amazing songwriting and her covers are incomparable. Everyone needs a copy of this album! Help get the word out to the powers that be so Anne can take her rightful place among the legendary blues soul and folk royalty. “Anne Weiss,The god-child of Aretha Franklin…4 octaves of goose bump and grind soul stylings that will haunt you long after the songs are sung”. Anne is a poet and a wordsmith. Anne’s latest CD, Concrete World and the Lover’s Dream, features David Jacobs-Strain and was produced by rock great Kenny Passarelli. It received a Radiolndy Gold Artist award and has been receiving national and international accolades. Anne combines her story-telling technique with her song-writing talent to create a combination of a gospel, blues, funk, folk ballad in this song, “Sunday River”. The listener is immediately taken with her imagery and passion. The audience is pulled in by her vocal ranges and harmonies and by the end one can see the girl at the bank, playing innocently in the sun, while around her war rages on. This song, “Sunday River,” is timeless and appropriate for today’s political climate. It is also the kind of song that needs to be sung not only on Sunday, but everyday, for all people, all over the world! (From announcer’s transcript – Butch Kara, host of “Kaleidoscope” scheduled for broadcast on 9/8/10 on KZGM-FM, Cabool MO as well as other Pacifica stations.) “When you hear our next artist, Portland-based Anne Weiss, you’ll probably be impressed as much by the poetry in her songs as you will be by her vibrant singing style. An accomplished poet who studied with Alan Ginsberg, the metaphorical imagery in her songs can be both exotic and bitingly to the point. With a voice that soars, belts out a bluesy wail, and even growls like Janis Joplin, Weiss’ singing puts a sharp edge on a lyrical message that reflects not only her poetic sensibilities, but her social activism. “Anne Weiss has three albums out, and we’re going to sample some tracks from her most recent CD, Concrete World and the Lover’s Dream. While this collection includes original takes on classics by blues icons like Robert Johnson and Mississippi Fred McDowell, as well as Marvin Gaye, Jackson Browne and others, what’ll really captivate you are Weiss’ own originals, ranging from love, to war, to the the walls and boundaries that she’d like all of us to tear down. Here’s Anne Weiss…. ++++ Fall; The Song About the Affair I Am Not Having; Sunday River; Concrete World and the Lover’s Dream Anne Weiss, with the title track from her album Concrete World and the Lover’s Dream. We also heard three other Anne Weiss originals from that album – Sunday River, The Song About the Affair I am Not Having, and we started off with Fall. And if you’d like to know more about the songs and poetry of Anne Weiss, her website is anneweiss.com – and by the way, her name is spelled a n n e w e i s s. And I notice on that website she’s also got an intriguing instructional CD called Singing for the Vocally Challenged – might have to check that out myself. Man, it’s been a while since I’ve seen Kenny Passarelli’s name crop up. He’d been a founding member of (Joe Walsh’s) Barnstorm and later involved with Dan Fogelberg, Hall & Oates, and others, but has been, at least to the general public, pretty much dormant for a while, so, like the similar re-emergence of Terry Sylvester recently, catching his sobriquet as producer and bass player here was surprising. It also signified the probability that there’d be some informed music-making going on…and there is. Anne Weiss is a ground-level singer somewhat in the vein of Maria Muldaur, Martha Velez, and others but a good deal gutsier, earthier, and more believable. She crafts her own songs well, then pulls in some great covers, including an unusually upbeat take on Robert Johnson’s Come On in My Kitchen. The session players, presumably gathered by Passarelli, provide excellent backing, and Weiss herself, in the liner notes, makes passing reference to the old A&M days, which Concrete World very staunchly revives. An indie figure since 1994, she’s supported such names as Taj Mahal, Richie Havens, Anne DiFranco, Dan Fogelberg, and others, which should give more than a little indication of her integrity in others’ eyes. I’ve no idea what her three earlier releases sounded like, but this one received the royal treatment, and the singer shows herself to be every inch equal to the requirements for such fortune. Concrete Worl is summer music and, right now, that may be just the prescription to invite the listener to dive in, what with all the biting cold in much of the country. Once broached and its heat begins to seep throughout your wintertime burrow, the hip-swaying finger-snapping delta boogying that follows might be just about all you’ll need to keep spirits up and the blood thrumming. Start with the swingin’ take on Mississippi Fred McDowell’s Write Me a Few of Your Lines and find yourself irresistably caged into the whole disc. All songs written by Anne Weiss except as noted. I put this CD on the player with a heavy sense of duty, in the full, unhappy expectation that it would be yet another drearily self-absorbed, inner-gazing singer-songwriter effort. I quickly learned otherwise. Anne Weiss, who works out of Seattle, is a whole lot more like Bonnie Raitt than Joni Mitchell or any of her abundant, narcissistically sensitive progeny. Like Raitt, Weiss counts r&b, rock, country blues and the folk revival among her defining influences. Unlike Raitt, Weiss has not had to face the commercial pressures to sanitize her sound, and thus Concrete World & The Lover’s Dream will hold your — or anyway holds my — attention more than any Raitt disc I’ve heard in a while. For one thing, while this is definitely a band record, acoustic, not electric, guitar is the foundational instrument. The result is a surprisingly original, captivating approach that will grab you at the first cut, John Twist’s “I Ain’t Got No Reason to Lie to You,” a knockout. At least to the extent that my imperfect memory informs me, Weiss’s musical vision is not quite like anybody else’s. Her pipes are deep ones, but she employs them intelligently, resisting perhaps understandable temptations to turn them to various forms of excess. There is not a note oversung here; there is, on the other hand, plenty of restraint, nuance and vocal artistry. Though a gifted songwriter, Weiss is not so focused on her own compositions that she neglects other people’s work, which she exhumes tastefully. Few artists have the imagination, knowledge or guts to put songs by Mississippi Fred McDowell, Marvin Gaye and Jackson Browne on a single disc. Her cover of Browne’s “These Days” — which I will always associate with the 1970 Tom Rush version — is done in a fashion so inventive that on first hearing I almost didn’t recognize it. “Write Me a Few of Your Lines” is an impressive extrapolation from the classic McDowell original, likewise “Come on in My Kitchen” from Robert Johnson’s. Also in common with Raitt, Weiss has a keen social conscience, and her music addresses social ills like war and poverty, albeit too adroitly to come across as mere sermonizing. Even the protest material, in other words, works first as music and as finely crafted lyric. Not just the same old same old, Concrete World thrills with unexpected delights. I know Anne as a songwriter with sharp instincts and songs that’ll blow your hair back. I had no idea she was such a gifted blues singer too. That little rasp in her voice is perfect for classics like Robert Johnson’s “Come on in My Kitchen” as well as her own songs like the title cut. Her band doesn’t sound like a bunch of side players thrown together, but like a group who hangs out in their spare time, sharing tunes and swapping stories. There’s a great mix of covers and Anne’s originals. She does nothing half way, from the bitterness in “Liar’s Day” — about the futility of war, particularly this one we’re in — to the lustful tone of “Special Delivery,” delivered with beat box, a slappin’ acoustic guitar, funky horns and a gospel choir. Amen and pass the chocolate. It takes ovaries to tackle Marvin Gaye’s “What’s Going On” but she does it well, giving us enough of that great melody but making it her own with an earthy percussive arrangement. “Fall” is a wonderful anthem about keeping what’s good in this world and willing the rest to fall. She’s a talented lyricist, painting with vivid colors and texture. In “The Song About the Affair I’m Not Having” she sings, “This house of winter / Has no right to call your name / Thirty below wind chills the bone / And I’m bursting into flame.” “Sunday River” is a spiritual piece with a gospel flavor. There’s more classic blues in Mississippi Fred McDowell’s ” Write Me a Few of Your Lines.” Wrapping up the release is one of my favorite Jackson Browne tunes, “These Days.” She slows it down, making the words mean even more. Her expressive voice is accompanied by some damn fine acoustic guitar from David Jacob-Strains. Anne Weiss is the consummate professional. From recording with such luminaries as Shawn Colvin and Patty Larkin to performing with the likes of Ani DiFranco and Cephas & Wiggins, Weiss is a performer that other musicians look to with respect. She’s also an Allen Ginsburg Award winning poet, a former street gang member and political organizer. Weiss’ fourth CD, Concrete World And The Lover’s Dream is a collection of pop, country, blues and rock and roll that will surprise and delight listeners with Weiss’ ability to change character and presentation without losing the essential sense of her self. Let’s check it out! Weiss opens with Ain’t Got No Reason To Lie in a deceptively bluegrass tinged rendition that is amazingly straight forward when compared to what comes later. It’s a refreshingly uncomplicated take on the song that is startlingly apropos. The Song About The Affair That I Am Not Having finds Weiss moving a little more in the Soul sound she is comfortable with, but still staying with a somewhat light, pop sound. It’s as if with the first two songs Weiss is leaving herself open to multiple genres (Country, Americana, Pop) whereas she later moves more solidly into a Soul/R&B sound. Special Delivery is built around a beat box core that ties everything else together. This is one of the more intriguing songs on the album as we get to see the real shading of Weiss’ voice here for the first time. Anne Weiss drops any and all pretenses on Concrete World And The Lover’s Dream, bringing out every ounce of soul she possesses in a performance not to be missed. It just keeps coming on Robert Johnson’s Come On In My Kitchen, The Blues/Soul sound here is as thick as cream cheese. Weiss reminds me distinctly of one of my favorite female blues vocalists, Pamela Betti. There’s a Janis Joplin vibe here as well as Weiss opens up the throttle on a voice that has transformed from a vaguely sweet pop voice to a husky and worldly blues/rock sound in the course of five songs. Write Me A Few Of Your Lines is the highlight of the album. The classic tune from Mississippi Fred McDowell sounds like it was written for Weiss, and she does it full justice. Other highlights include Fall, Shadow Of Doubt and the cover of Jackson Browne’s These Days. Anne Weiss fits equally well into the Country, Blues and Rock genres that she dances across on Concrete World And The Lover’s Dream. Her voice is a diamond in the rough. Not smooth or pretty, but hewn by life and effort and full of a natural beauty that can’t be crafted. Weiss owns the songs she sings and wears them like a favorite dress. The real Weiss is millimeters from the surface in each song, striving to break through and touch the listener like a breeze. Concrete World And The Lover’s Dream is a fine album. Old-time blues, acoustic folk/funk, gospel, lite rock, soul-binding, southern-sounding, easy-listening, jazzy sensations and even a hip-hop element are all the styles of music associated with Anne Weiss and her latest work, Concrete World and The Lover’s Dream. Quite an array of arrangements on this record and that is what makes Weiss such a special/unique artist. Combine all of this together and you have yourself a full plate of THIS and THAT with plenty of SECONDS left over. So, I advise everyone to just eat this record up! I can’t look past the fact at how poetic the album is. Weiss’ words are extremely potent and she sings each line with such conviction. The power and soul behind her voice reminds me of a Janis Joplin while her folky, poem-style verses resemble the likes of Dylan, Simon—both Carly and Paul, James Taylor and Joan Baez just to name a few. Track three, “Special Delivery”, surprised me the most when a beat boxing effect was included within the song. When I think beat boxing, I think Doug E Fresh or Biz Markie; real hip-hop, beat-boxin’ cats. So, the fact that Weiss could blend this style of music into her own work and pull it off nicely is just an amazing aspect! Concrete World and The Lover’s Dream has no limitations as far as music boundaries go. Weiss proves that it’s all just MUSIC. Music that can be listened to by ANYONE and EVERYBODY is what Anne Weiss brings to the table here. There are terrific renditions such as: Robert Johnson’s “Come On In My Kitchen”, Marvin Gaye’s “What’s Going On” and Jackson Browne’s “These Days”. Weiss brings you back to the great sound of the Delta by paying tribute to blues legend, Robert Johnson. The classic, Delta Blues sound is prominent and the harmonica playing adds that extra element of a real blues sensation on “Come On In My Kitchen”. On Marvin Gaye’s classic, Weiss goes in a different direction by making the hit song more folk-like, but packed full with plenty of soul still. And finally on “These Days”, Weiss sings the song in such a sweet, soft and somber manner that would even make Jackson Browne proud. To end, I wanted to include certain lyrics from Weiss herself on “Sunday River”: “I am just the country, I am just the land. I had no intention like what they have planned. I would live in peace, my soil is for good. I am so misunderstand”. This is Weiss putting her poetic skills to the test and inviting listeners to really contemplate on this thought. Ponder on that now, if you like. For more on Anne Weiss and Concrete World and The Lover’s Dream, SKOPE out www.anneweiss.com or www.myspace.com/anneweissmusic.com. “I Ain’t Got No Reason To Lie To You” is a track that showcases Weiss’ strength, putting her in a perfect position between a Sarah McLachlan and a Natalie Cole. The track, easily single quality, gets listeners interested in what is to come on “Concrete World and the Lover’s Dream”, the latest effort by Weiss. “I Ain’t Got No Reason” also feeds well into “The Song About The Affair That I Am Not Having”. “The Song” is vital to “Concrete World” because it puts the guitar track as a focal point of the track, rivaling the vocals for dominance. The bickering back and forth between the instrumental and vocal sides of Weiss’ works forces each element to step up its game to the point that what results on the album is the best possible music. Each of the album’s 12 tracks could easily be on rotation on alternative rock stations, and unlike many other efforts in the same genre, the album gets stronger as it plays on. This is perfectly shown during “Concrete World”‘s penultimate track, “Shadow of Doubt”. This is due to the fact that “Shadow of Doubt” is a track that will speak equally well to those just getting into alternative music as to those that have been listening in for decades; the composition created here by Weiss is just that impressive, linking together instrumental with vocal and atmospherical into something that is decidedly greater than the sum of its constituent parts. The disc ends with “These Days”, a song that is stellar both in its role as a disc closer as well as a transition to parts unknown, possibly giving listeners clues to what path Weiss will ultimately take in regards to the follow up to “Concrete World”. Without a flaw, without a weak patch, what Anne Weiss does here during “Concrete World and the Lover’s Dream” is show to the world her vibrant soul and inimitable talent. Make it a point to pick up this and her earlier recordings, as well as make a sojourn to whatever venue that she may be playing in the months or years to come. Kudos, Weiss, for making a jaded reviewer smile. Just want you to know that I found you quite by accident. I was with a friend and I saw the cover of the album, having no idea who you were. Went home , played it, played it again, and again. Still playing it 2 and 1/2 months later and bought 9 of them to give to my friends. Probably will buy more. Thank you , I love it , can’t wait for you to come to Eugene. Oh by the way one review wrote that you did a \”nice cover of \”What\’s going on?\” Not only nice but truely awesome , wonderful, and just the best . I play it to get inspired to be inspired ! Helps get me going on my ski machine. So thank you thank you. love you Anne. “Concrete World and the Lover’s Dream” by Anne Weiss is a funk/blues solo female album with a poetic flair. Anne’s voice is one of the more well known in Oregon and for good reason. She sings with her heart and soul. She possesses that great blues quality of grit and grace, and her lyrics are great life stories. Big name artists such as Janis Joplin and Tracy Chapman come to mind when listening to Anne’s outstanding music. Anne’s musical background is quite diverse and she brings that influence to the arrangements. Hints of urban and latin music are sprinkled throughout the CD, as well as a few other surprises. The band ties the sound together nicely, and are superior musicians. Highlights include “Special Delivery” with its assortment of sounds. You get great vocals, blues, street beats and Motown horns on this track. The title track “Concrete World and the Lover’s Dream” makes “Blackbird” pop into your head in the beginning and then evolves into a dirge with a powerful message. Anne also does a real nice cover of Marvin Gaye’s “What’s Going On” on this CD. If you enjoy listening to outstanding songwriting and outstanding bluesy-rock female vocalists, give this CD a try. “Concrete World and the Lover’s Dream is the new tour de force CD from the Northwest’s Anne Weiss. Impeccably produced and supported by an amazing cast of musicians, the diverse arrangements and choices of songs on this CD allows the many facets of this jewel to fully shine. Whether Anne is belting out a delta blues tune or singing an achingly tender ballad, every moment of this CD is filled with passion and conviction and reminds us all that if we can’t dance…we don’t want to be part of any revolution”. Heard you today on XM. Between you and Aretha I was turned to putty. With a powerful blend of vocal, instrumental and lyrical styles from new folk to blues and gospel, Crossing The Border pushes the boundries of personal, political and cultural assumptions. This album demonstrates Anne’s impressive range of vocal emotion and unique, poetic, and diverse songwriting ability. Crossing the Border was one of those pleasant surprises. I had never heard Anne before, but this is becoming one my favorite recordings of late. For those who have not yet heard Anne Weiss, imagine a vocal style smack in- between Dar Williams and Shawn Colvin. In fact, upon closer inspection, you will notice Dar’s presence providing harmony to “House Where Everybody’s Home”. Her lyrics are deep, and sometimes dark. Sometimes she serves them up with great range, and power — other times gently, with beauty. Whichever way she chooses to take a song, her mastery is evident. She seems equally at home belting them out or gently pulling them along. One of the simpler songs on the recording is also the most personal. “Dad’s Pocket,” which is dedicated to her father, is a beautiful reminiscence — “I crawled into the pocket of your flannel shirt still hanging on the wall. It’s still got tractor grease on it — I come here when I’m feeling small”. The title cut, Crossing The Border, is the other side of Anne. It begins with a thumping beat, reminiscent of Hendrix’ “Foxy Lady,” giving way to vocals which sound like Ani DiFranco in a tin can. With lots of slide guitar and driving bass,Weiss sings of the racism, however slight within our selves. — “In America, riding on the bus, a girl from Nagasaki suddenly turns and smiles at us. If love sees no color, if justice is blind, if there’s a fence in your conscience — maybe you better jump your mind.” — All of Anne’s lyrics hold this kind of power. There are many incredible aural moments to enjoy as well, such as her addition of a full gospel choir on “Mountain,” as well as the bonus track “He Will Answer Prayer,” a live cut from Gospel Fest 94 recorded at the Flynn Theatre in Burlington, Vermont. Anne Weiss also explores blues territory on another live track called “Looks Like Satin, Acts Like Steel,” incorporating horns and her incredible range to the mix. She doesn’t stop there, but delivers a beautiful version of “Mi Luna,” sung sweetly in Spanish. It keeps growing on me. I wanted to write this three months ago, but new windows into it continue to open for me. The CD is dedicated to Ngawang Choephel who is serving 18 years as a political prisoner in Chinese occupied Tibet for making a film of traditional music and dance. Don’t pass this one up. 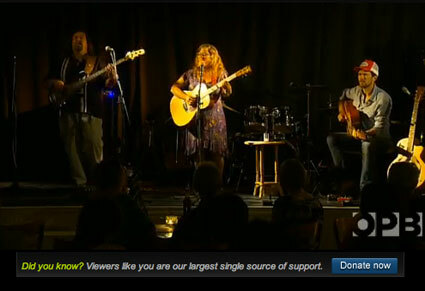 “(Anne Weiss CD release)…Best show I’ve seen in a long time. Incredible musicianship, amazing voice and stage presence, a very fun show showcasing one of the most talented vocalists in the country with a cast of supporting stars who are also among the best in their fields. I heard about Anne Weiss the best way–by word of mouth. The Portland musicians I respect the most kept telling me I had to hear her music. They were right. Anne has a voice that goes from warm and soothing on a folk ballad to big and powerful when she sings the blues (kind of like Janis Joplin but with more versatility). And Anne also has a way with words, writing most of her own fine songs. Anne’s music doesn’t fit neatly in one section of the music store. Sure it’s folk and blues. But it’s also gospel and R&B, with occasional hits of Latin, funk and even classical. Her new double-CD “When Folk Gets The Blues” has some of all her styles. It will find a comfortable place on your CD player. Better yet, catch Anne Weiss in person. She’s an engaging performer whether she’s playing solo or backed up by her band and gospel choir. One more thing. Anne is incredibly generous with her talent. She performs with the NW Gospel Choir for the annual Oregon Symphony “Gospel Christmas”, she teaches guitar and voice, and, best of all, she leads the “Everyone Welcome Community Choir” where people of all ages , abilities and backgrounds can come together and sing together for the simple joy of making music. Now I’m a big fan of Anne Weiss’ music. What a fabulous, fabulous CD release concert last night – WONDERFUL music and synergy with so many talented musicians brought together thanks to you, your great, contagious energy and love for music – can’t thank you enough!! And now I’m getting to re-experience much of your beautiful songs on the CDs! deeply touching…tears..laughter…joyful singing along…and just rockin’ on!! Don’t miss this chance to check out a woman whose music shouts out her life lived on the front lines of making good change in all the ways that matter – including the right to sing about it all. Songs of a rich life – lived on the edge. Anne will be presenting songs from her new CD Concrete World and the Lover’s Dream, produced by rock great Kenny Passarelli, which showcases Anne’s wide-ranging musical talents. Anne’s music collaborators have included Dar Williams, Ani DiFranco, Richie Havens, Taj Mahal, Cheryl Wheeler, Dan Fogelberg, and Greg Brown. Her songs draw on the richness of her life – daughter of an opera singer, classical pianist turned blues guitarist, NY street gang member, mountaineer, social activist here and abroad, and writer/performer of songs that will stay with you forever. This is a don’t miss night as Anne will be accompanied by local favorite Sarah Allen Pella/Radio Antoinette (formerly http://www.supermodelumberjack.com). Only $7! Returning from a tour around Ireland in the afternoon and performing in Lunt Basement at night is, to say the least, a busy day. Anne Weiss did just this the Thursday before break, which affirmed her position as a performing veteran. Weiss’s style is approachable and emotionally raw, allowing the audience a glimpse into her soul. Weiss came to Haverford after an invitation from her relative, Chris Healy ’09. He even performed with her for a few of the songs. The two shared good stage chemistry, and Healy’s improvised violin and vocal parts complemented Weiss. Weiss opened with a song about being late for a show and stranded at this gas station. The song included images of a Honduran truck driver laughing at her and a woman making her an unwanted arugula sandwich. With this song, we were introduced to her styles: talky vocals with soaring falsetto accompanied by her guitar, which she also used percussively. Her voice was at times reminiscent of Melissa Ethridge when she tried to surpass her comfortable register. Her scratchy, cool voice complemented the funny song very well. “Shadow of Doubt” was a bluesy tune that she prefaced with the fact that when listening to the blues, at least you know that someone out there was feeling as bad as you. Healy’s improvised violin for this song was surely impressive. Weiss played a fun song about Juanita, a 200-lb., over-alled 55-year-old woman she came across in a dance club. It included lyrics emphasizing everyone’s attraction to her despite her unconventionally beautiful appearance and her fashion choices, some of which became sing-alongs: “oooo-ooooover-allllls.” Another song was about the affair she wanted to but did not have entitled “The Song About the Affair that I am Not Having,” in which her voice reminded me of the lead singer of Heart. My favorite as “Sorels,” named for the hefty, furry boots fit for the Arctic. This humorous ode to the boots that saved her from losing a limb to frostbite was evocative of a Kimya Dawson song, but without the underlying sadness. Weiss performed “A Day of Celebration” with the S-Chords. My impression of Weiss included the notion that college a cappella was the polar opposite of “her thing,” but she was up for something new. Rob Harbison ’10 started singing “MMMBop” for a moment, but then got serious. His vocal percussion kept the at times cacophonous song together. Not only did the S-Chords help Weiss out, she encouraged the audience to sing along. And to my surprise, most everyone there sang along. In fact, it was the first time in a while where I didn’t feel like an idiot during audience participation, which I suppose is a testament to Weiss’s sincerity. At times, Weiss reminded me of Norwegian pop singer Maria Mena, in the best possible way. Remember her song “You Are the Only One”? No? Whatever. Watch the awful music video if you care. Or you can just listen to Anne Weiss and enjoy an experienced, learned, excellent artist. This article is © 2008 The Bi-College News. The material on this page is free for personal or educational use, but may not be reproduced, reprinted, republished, redistributed, or otherwise transmitted to a third party without the express written permission of The Bi-College News, 370 Lancaster Ave, Haverford, PA 19041. Anne Weiss is one of those rare artists that has it all: powerful emotionally stunning vocals, fantastic guitar work that is tastefully executed, and songwriter extrordinaire. Few artists end up with this much talent in so many areas. A masterpiece! One of the only performers who excels at every style of music out there, with incredibly well written lyrical craft, super cool guitar chops and a voice that stops you dead in your tracks, she belts out mind boggling blues, out of body experience gospel, superb singer/songwriter craft that pulls every emotion imaginable out of the innermost recesses of your mind, extraordinary political insight and social commentary, Anne is in a league all by herself. An absolutely extraordinary experience to hear Anne’s music. If you haven’t seen Anne Weiss perform, you’ve been missing out on one of the most transcendent musical experiences in the Northwest. Rarely is an artist able to combine such intelligent, impassioned songwriting with vocal abilities of such stunning beauty and staggering skill. Her words will capture your mind, her voice will steal your heart, and her music will move you to very depths of your soul. I loved your songs, your voice, your presence. The crowd loved you and I hope you got some new fans. For sure, I’m one now! Aside from Janis Joplin, I can think of no other female vocalist who emits anything close to the power, grace, beauty, sorrow, strength, artistry and passion of Anne Weiss. Music is so subjective that I shy away from proclaiming any musician “the best” at their craft – but there is no singer living today who has impressed me more deeply than Anne Weiss. Her performances are nothing short of stunning, and I have seen the enormity of Anne’s talent and expression move audience members to tears on several occasions. – Kristin Valinsky, Portland Oregon concert promoter/publicist. “In the presence of a true voice, you find someone understands how it has been for you. She has helped your story by telling her own. That’s how it is in this book. This is a concert of road stories from Anne’s life that will summon a concert from your soul.